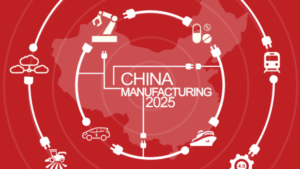 We continue the discussion on the China Manufacturing 2025 program, the great industrial plan that China put in place in 2015, and by recalling what the plan consists of and what are the possible challenges and opportunities for Western companies. My followers know very well what my point of view is: a tsunami that will hit Europe, which is completely unprepared to respond to this challenge because it believes, underestimating it, that the CM2025 is the Chinese equivalent of our Impresa 4.0. The business plan is contained in various volumes, the last one released a few days ago, 500 pages all written in Chinese. Among the many differences that exist between the Chinese industrial plan and the Italian one, there is that, in China, the strategy starts from the central government and is transmitted in cascade to all companies, both state and private, and to all local governments so that all interested parties work in sync with fully aligned interests. The Chinese government has the ability to indicate what should be produced, indicating the deadlines and from which company, in which province and, fundamentally, has total control of the economy so that it is able to implement policies of income redistribution where they should, as is likely, to create economic and social imbalances caused by the production choices mentioned above. To better understand I give you an example as if the same method were adopted in Europe: the Commission should decide that Fiat and not BWM or Volvo will have to produce a fixed number of electric vehicles, produced in Termini and not in Poland. The same Fiat will then share part of the profits with the government of Bavaria and of Sweden to compensate for the lack of business, and Termini will pay the European coffers compensation for having been chosen. This is how it works in China. 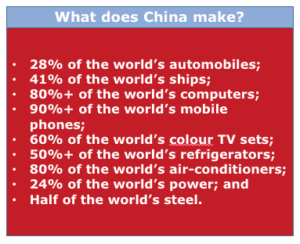 So I think we all understand why I decided to call it a Chinese Manufacturing tsunami. The second difference between CM2025 and Impresa 4.0 consists in the fact that the Chinese industrial plan has clearly identified 10 industrial sectors, for each of which sub-sectors have been identified up to various levels and, for each of them, the world growth rates and the market share that China intends to achieve, in some very specific cases. China will give priority to the sectors of Robotics, Aerospace, Information Technology, Maritime Engineering, Rail Transport, Electric Vehicles, Agricultural Machinery, New Materials, Biopharmaceuticals, electric machinery. The cardinal point is that the list is a mixture of new and old economy and inside the plan the Chinese industrial agriculture matters as much as the aerospace industry. In our Industria 4.0, the list of our government does not include 10 sectors, but 10 actions, which however have the limit to focus mainly on incentives and tax relief, but not many investments on the top line and little (as far as I know) clear and precise objectives. Just to give an example, the plan has as its objective that in 2020 China will have 15% of the global microchip market for mobile terminals, and in 2025 this share will reach 20%. So far as for all products and sub-products of the ten sectors.